Kerri Walsh Jennings has taken on two roles that are equally deserving of gold medals: being an Olympian and a mother. 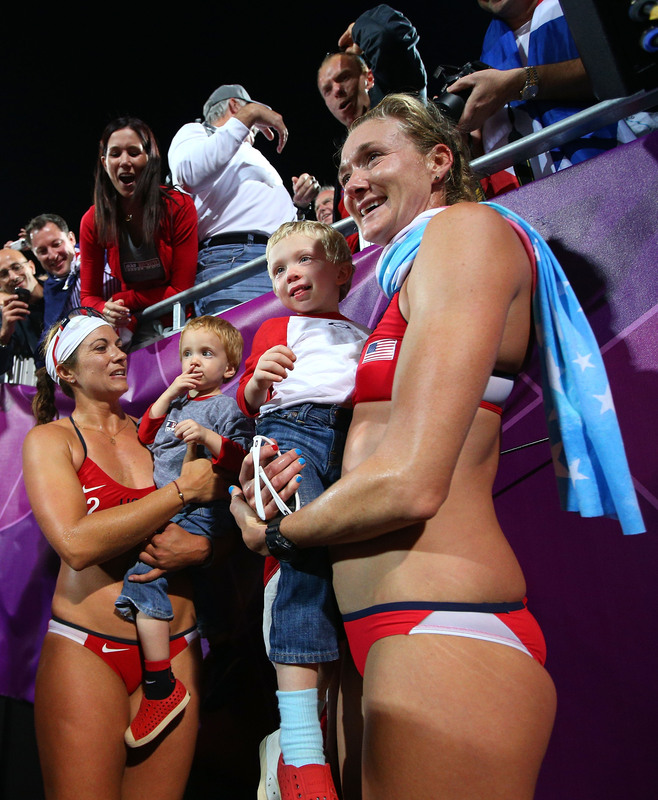 Heralded as one of the greatest beach volleyball players of all time, Walsh Jennings has taken to court after court in pursuit of gold — and has done so all while balancing the challenging demands of motherhood. And why not? Walsh Jennings' kids have helped her to (not distracted her from, as her critics once argued they would) become an even better Olympian. Along with her husband, fellow professional volleyball player Casey Jennings, Walsh Jennings is mother of Scout, Sundance, and Joey, aged three through seven. The Olympian's role as a mother came into a more prominent public light shortly after the 2012 Summer Olympic Games, when she revealed that she had actually been pregnant with her third child during her time in London. The then-34-year-old Walsh Jennings told TODAY: "When I was throwing my body around fearlessly, and going for gold for our country, I was pregnant..." Doctors had assured her that her Olympic maneuvers wouldn't bring any harm to the baby. Walsh Jennings said that her first clue that she was pregnant came when she felt that some of her mood swings couldn't be described as Olympics jitters. But despite these changes to her body, the Olympian still feels like she was at the top of her game, and that the prospect of having another child actually helped focus her during training and matches: "I gave everything I had. At the end of my tunnel was this next phase, expanding my family. I wanted to earn that third." Walsh Jennings has used this same motivation to catapult herself to the Rio Olympics as well. Though she suffered a defeat to the Brazilian volleyball team during the semifinals, the Olympian went nearly the entire summer games without a single loss. Perhaps her kids offer up some otherworldly motivation — in all of her years competing in the games, this recent loss was the first Olympic defeat she had experienced. Still, the athlete has confessed that it of course hasn't all been easy. Balancing any job, whether motherhood or fatherhood, with the demands of being a parent isn't without its challenges. Olympian swimmer Michael Phelps has likewise shared the struggles of being apart from his newborn. She told The Denver Post that she wanted to find life beyond volleyball, and though there have been some difficulties, she wouldn't have it any other way: "I have appreciated my volleyball more, I have appreciated my body more, I have appreciated my life more by adding this component of being a mommy... We’re chasing this Olympic dream together now. It’s not just me. It’s my tribe. Life is meant to be shared. My kids feed me, they don’t distract from me."